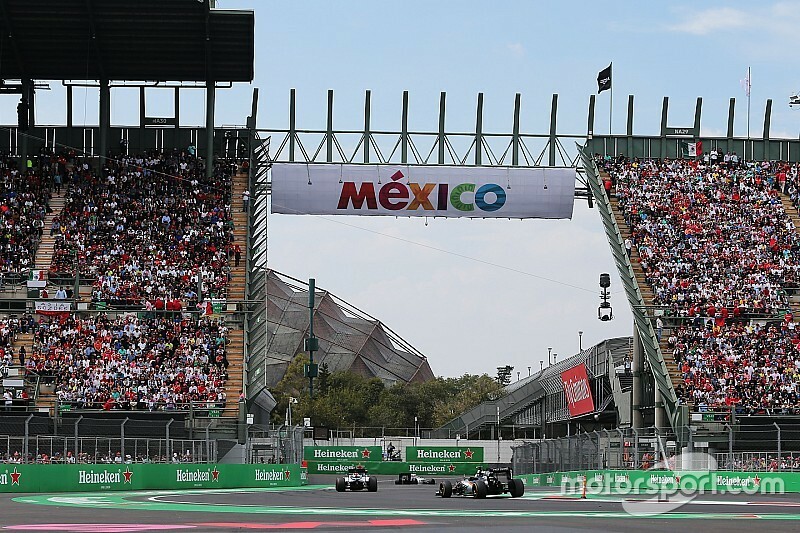 With barely time to properly digest the US GP, we are back to the Autodromo Hermandes Rodriguez at Mexico city. Some 6500 feet above sea level, the rarefied air of this altitude will tax the hybrid engines and sap power. Chassis excellence would be the differenciating factor at this race. It is all about downforce this weekend. Due to the rarefied air, drag is reduced and closer racing and higher top speed are possible. This kind of levels the playing field for the top three teams which brings Redbull firmly in the mix for the fight for the win at this race. Racing has been taking place in Mexico city since 1962 with Jim Clarke the first winner of this race. Incidentally, Jim Clark has the most win of this track with 3 wins. The Lotus has the most constructors win of the track with four Lotus car wins. One race lap is 4.3km with a full race covering a distance of 305.4km from lights to flag over 71 gruesome and sweaty laps. It is typically a very bumpy track. The fastest lap of the track is held by Vettel at 1:16:488 to take pole in 2017. Max Verstapenn is the last winner of this track in the same year. Max Verstapenn and Lewis Hamilton are the only two drivers to win this race in the current generation of drivers on the grid. Vettel and Hamilton crashed into each other in the opening lap of this race in the 2017 season, sending both driver to the tail of the grid. Vettel muscled his way up to forth with Hamilton only able to get his wounded car up to ninth. Which was enough for for him to win the 2017 drivers title. It is going to be a cracking race as the Redbull are set to ruffle the feathers of Mercedes and Ferrari as they gun for the win which could put the Redbull win tally at four and one better than they were able to manage last season. Last edited by Nitrodaze; 24th October 2018 at 18:17. Better a witty fool than a foolish wit. So, so happy this track is back.
" Lady - I'm in an awful dilemma. Moe - Yeah, I never cared much for these foreign cars either." Turn 6 wrecks my head as do turns 13&14. Nice for the spectators in all but they ruin the flow to what is an otherwise really nice track. Last edited by The Black Knight; 25th October 2018 at 09:25. Turns 13 - 16 were not there at one time but I have no complaints. This is a good track like COTA. I would love to see these two back up with Canada as a North American swing. I couldn't watch qually due to our TV packages, but it sounds like it had some great driving. Ricciardo squeezes out Max for the top spot, with Hamilton in third and Vettel in fourth. With that long tow on the start I'd say it's possible that the Merc or Ferrari get past a car or maybe both, but I also suspect that Lewis will just take the line that seems safe and try to stay out of trouble. This first turn might collect a car or two, especially with Vettel behind two of the latest of late brakers. Interesting that for this race only 5 teams make the top 10 starters, and not much mixing up of teams from the top to bottom of the grid. Mexico is one of the tracks which I like (though I thought it was better before the stadium section was added). The altitude causes a few problems for teams and engine management is a key factor. The Mexican fans are wild about the race and its always a good time. It would be fun to go back - I was there for CART. Ricciado wipes the smile off Verstapenn's face with a scintillating lap. The top six were two seconds faster than Vettel's lap record from 2017. We are set for another drag race to the first corner with Verstapenn likely to want to steal the lead from Ricciado, Hamilton and Vettel jockeying for the slipstream of the Redbulls to slingshot into the lead. The straight line speed of the Mercedes and Ferrari is likely to give the Redbulls some problems along the pit straight, with the Redbulls exerting their strength at the first corner. It is going to be a colossal race from lights out to the end of the first lap. You don't wanna miss this one. Last edited by Nitrodaze; 28th October 2018 at 04:49. Mexico always reveals the order of the quality of the chassis on the grid. Clearly Mercedes has the 3rd best chassis behind Ferrari, whom are behind the Redbull. Last edited by Nitrodaze; 29th October 2018 at 11:15. Oct. 31, 1999 - one of the blackest days in motorsports. https://www.rallies.info/webentry/2019/pirellibrc/entries.php?type=u Regarding to the i20 R5 project, entrant no. 29 clearly shows otherwise. I think they own the forest. All times are GMT +1. The time now is 09:13.